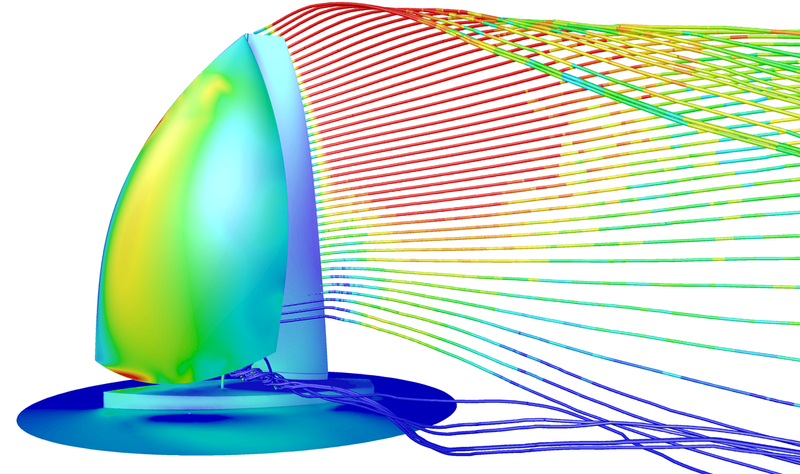 The proposed project aims to investigate the fluid dynamics of yacht sails. Sails have unique flow features, which allows the generation of very high lift and high lift/drag ratio compared to wings and blades commonly used in other fields such as aeronautics and turbo machinery. The project aims to understand the underlying mechanisms of these flow features in order to allow the performance of sails to be further enhanced and, importantly, to allow the cross fertilisation of ideas in research fields where there is a need for fluid dynamic efficiency. on rounded-nose foils used for low-pressure turbines a similar features known as the laminar separation bubble (LSB) occurs. In the present project, it is proposed to test large-scale flexible sails in a wind tunnel to measure forces and the flying shape of sails, and then to build a rigid small-scale model to be tested in a water tunnel in order to perform flow measurements with LDV and PIV. Experimental measurements will be complemented with computational fluid dynamics (CFD) in order to test a wide range of conditions, which are tested with difficulty experimentally. In particular, numerical experiments will be performed with LES and DNS on 2D extruded geometries in order to investigate the natural-transition mechanisms on LEV. It should be noted that DNS, LES and water tunnel experiments have never been used to investigate the fluid dynamics of sails.